Recipe Chocolate Banana Ice Special Favor.If you want to present a simple and refreshing snack for the family, then maybe chocolate banana ice recipes worth trying. As the name implies, the main ingredients of this snack is a banana. During this banana is very easy to dikreasikan a variety of things. The most common is fried bananas or banana compote. But this time, banana chocolate banana ice dikreasikan a unique and refreshing. 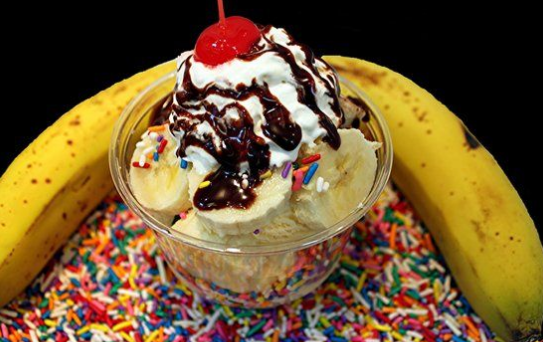 It is not hard if you want to make chocolate banana ice. The materials needed are very easy to find. How to make it not too difficult. So is the time it takes to make chocolate banana ice. No need to wait a long time, the family and loved ones had been able to taste the chocolate banana ice. Here's a banana chocolate ice recipes, who knows could help you. Sugar and cocoa powder and then mixed together in a blender until smooth. Set skillet heat the oil then fry until boiling. After the sugar and cocoa powder that has been incorporated into the blended oil and stir until blended. Bananas were previously frozen suda cut and then dipped into the liquid chocolate. After that roll over meses or beans. Both of these materials can be changed according to your taste. After being ousted over meses material or nuts, put them in thick plastic. Allow the bananas in the freezer until frozen chocolate. If it is entirely frozen, chocolate banana ice can already served. Not hard right to make it? Not just to be served at home, chocolate banana ice also could be one of the business opportunity for you. By making a chocolate banana ice in large quantities and then left it in the stall. Capital is not too big but gains could be achieved. Thus chocolate banana ice recipes may be useful to you. 0 Komentar Untuk "Recipe Chocolate Banana Ice Special Favor"